I made a simple 4” x 6” invitation using Pages on my Mac and printed them at Costco. It might sound a little strange, but because of our sloped lot, we often entertain in our driveway! It is a nice, flat, large surface for tables and chairs. Therefore, we decorate our garage door! The door was covered in color paper from the teacher supply store (4' wide & you can buy it by the yard). You can see that my version of the paper chain varies from the traditional way of constructing them. 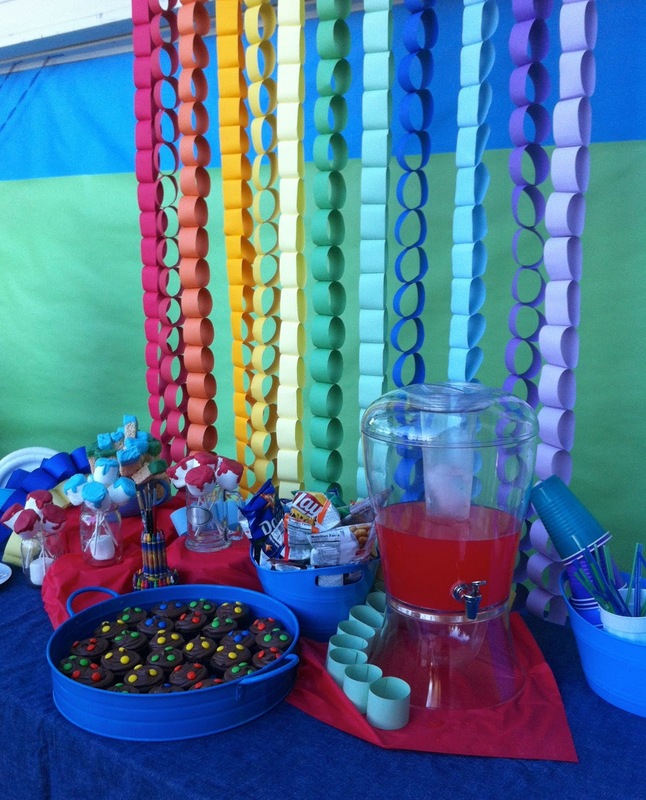 The circles were stapled together for maximum color impact from the front of the dessert & drink table. Cupcakes topped with colorful candy, rice crispy treats paintbrushes, and paint pot marshmallow pops made up the yummy treats. For the centerpieces, I gathered my old oil and watercolor brushes and put them in the large cans (after I removed the spaghetti sauce labels). 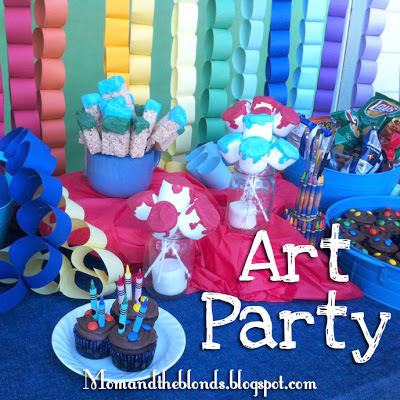 I filled plastic cups with colored treats and snacks to represent the color wheel and arranged them around the paintbrush cans. Unfortunately, there is no picture of the color wheel cups, but each cup had a single colored item inside (red licorice, orange goldfish crackers, green M&M's, blue Crunch bars, etc). 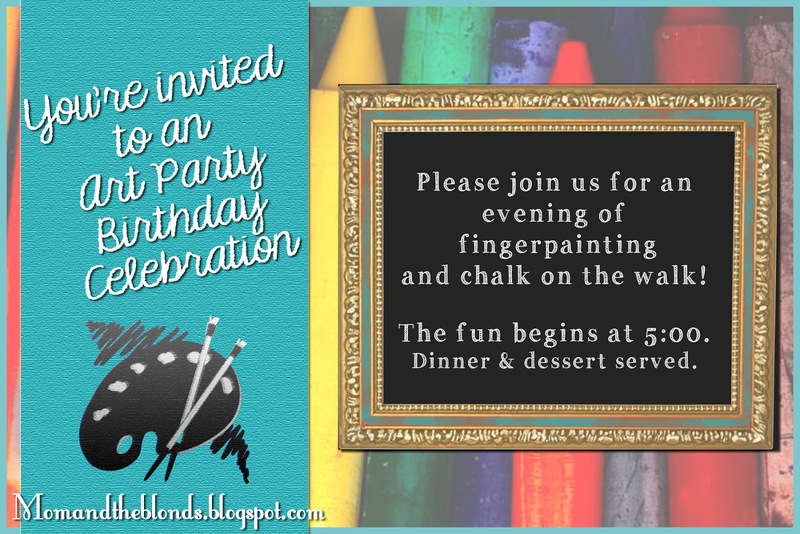 Activities included finger painting and drawing with chalk on the driveway. I found colorful t-shirts at the dollar store to keep the mess off of the little artists’ clothes. In honor of the Italian Renaissance artists, we enjoyed a simple meal of spaghetti with meatballs, salad, and garlic bread, much of which was able to be prepared ahead of time and kept warm in a crock pot. My little artist really enjoyed his birthday celebration. Thank you to my friend, April, for taking such great pictures at the party!